Infinitives are used for the real, abstract and future actions. An infinitive that takes to before it is called infinitive with to. 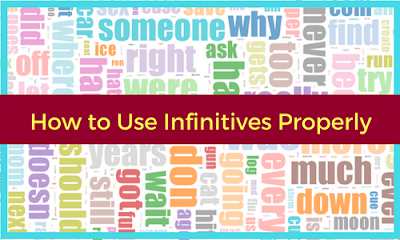 Generally, students think that if we have infinitive with to in a sentence, we will use only 1st form of verb while we must know this rule to use the suitable verb with it. Sometimes we use infinitive with to as an object of preposition. Allow, advice, expect, encourage, forbid, force, tell, want, warn, teach, show, remind, invite, order, permit after these verbs we use object + infinitive with to instead of that. Because sometimes we can see our sentence with (that) instead of (to) in our sentence. Able, unable, glad, happy, angry, fit, stupid, wrong, right, lucky, disappointed after these adjectives we use infinitive with to. There are some nouns that take infinitive with to and these nouns are wish, decision, need, pleasure etc. When infinitive with to use for qualifying noun, verb, adjective or any sentence it is called gerundial or qualifying infinitive. That’s why sentence looks correct in the gerund form but actually the sentence does not correct. Sometimes we can see some auxiliary verbs i.e. can, could, may, might, shall, should, will, would, must in a sentence so we need to remove to from that sentence to correct that sentence.